Plucky Taylor Greer grows up poor in rural Kentucky with two goals: to avoid pregnancy and to get away. She succeeds on both counts when she buys an old car and heads west. But midway across the country, motherhood catches up with her when she becomes guardian of an abandoned baby girl she calls Turtle. In Tucson they encounter an extraordinary array of people, and with their help, Taylor builds herself and her sweet, stunned child, a life. Okay, full disclosure: I have no idea how this book came into my life. It’s been sitting on my shelf for years, slowly working its way up my reading list, and the beginning of this week was it’s moment. I wasn’t excited; the cover and the blurb combined allowed me to generalise this novel into something I knew I wouldn’t enjoy. Then I read the first line - I have been afraid of putting air in a tire ever since I saw a tractor tire blow up and throw Newt Hardbine’s father over the top of the Standard Oil sign - and I knew I had something special in my hands. And, truly, it’s that first line which epitomises our narrator. She’s something else. The entire narrative was peppered with odd thoughts, sarcastic comments, and naive (sometimes contrasting) ideas. I loved her. Although she was sassy, she was so pure of heart, so raw. The lessons she learns throughout the pages are important, but what’s more important is how she reacts to them. Her growth was stupendous, and yet she kept her perfect personality right up until the last line. On the surface, this book is about motherhood, and females holding each other up. Digging deeper, however, there’s commentary on human rights, on immigration laws, and just plainly comments around how a person is a person, no matter their origin story. Taylor’s naivety in these particular areas was powerful; her confusion at America’s refusal to allow people to settle, and that the government actually hunted these people down, was pure as hell, and difficult to disagree with. Each of Kingsolver’s characters had their own purity, despite their flaws. 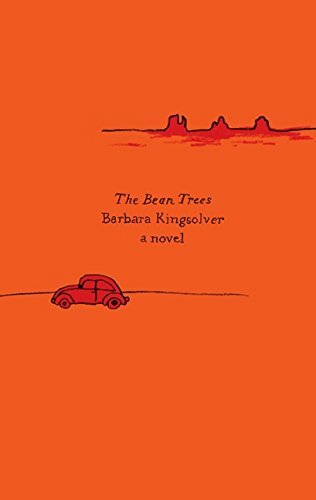 I loved each of them deeply, and Kingsolver’s expert way of writing their dialogue was a huge factor in that. They were so realistic, so utterly human, that it was impossible for any other emotion to come out. I may even end up naming my first child Turtle. A beautiful, gorgeous, masterpiece of a book. I could go on forever about how much I loved it without actually pinpointing what I loved in particular. I feel this review is a failure because I can’t seem to articulate what that was. It was everything, it was glorious; I’m devastated I’ve come to the end. It’s the kind of book you finish and mourn because you feel as though you’ve left your friends behind.